Anti-vascular endothelial growth factor (anti-VEGF) therapies have provided significant improvements in visual outcomes to patients with wet age-related macular degeneration (AMD), retinal vascular occlusions, and diabetic retinopathy.1,2 Studies have shown that when patients are treated less frequently than recommended by randomized clinical trials, it can lead to inferior visual outcomes.3,4 Repeated injections are a burden to patients, caregivers, retina specialists/staff, and the healthcare system, and may contribute to anti-VEGF undertreatment. Long-term drug delivery for retinal diseases would reduce the treatment burden of administering anti-VEGF drugs frequently. Encapsulated Cell Therapy (ECT) (Neurotech Pharmaceuticals, Inc.; Cumberland, RI) utilizes a proprietary, immortalized, non-tumorigenic RPE cell line that is genetically engineered to produce a wide array of therapeutic proteins including cytokines, monoclonal antibodies, FAB fragments, fusion proteins, and peptides. The cells are housed in individual rods that contain a matrix that supports cell survival/function, and a semipermeable membrane that enables the outward passage of drug and the inward diffusion of oxygen and nutrients without eliciting an inflammatory response. Multiple rods can be combined to form a device that is surgically implanted into the vitreous cavity through a ≤3mm scleral incision and sutured to the scleral wall using a titanium clip. The ECT platform has many potential advantages over other long-term delivery therapies. It can support the continuous delivery of a wide array of therapeutic proteins into the vitreous, singly or in combination with one or more additional drugs. It can consistently deliver proteins for at least two years5 to treat a broad range of retinal diseases,6,7 although more recent explant data have suggested sustained delivery for at least five years (data on file). In addition, the relatively low sustained dose of drug emitted into the vitreous with an ECT implant may minimize local and systemic adverse events that can occur from bolus injections. Perhaps, most importantly, ECT implants are sutured to the sclera by a titanium clip and are easily removable, if necessary. Since the host has not been genetically modified in any way, as with gene therapy, the removal of the implant immediately stops any further exposure to the drug. Using ECT, ciliary neurotrophic factor (CNTF), also known as NT-501, has been investigated in phase 1/2 trials for the treatment of retinitis pigmentosa (RP) and geographic atrophy (GA). Although increases in the outer retinal layers were observed by optical coherence tomography, the RP trial did not show improvements in visual field;7 however, the GA study did suggest a preservation in visual acuity compared with the sham treated group.6 ECT was found to be generally safe with no signs of clinically significant uveitis or rejection. Currently, the MACTEL project is studying NT-501 for the treatment of patients with idiopathic perifoveal telangiectasis type 2. Early pilot data in patients with glaucoma suggest an improvement in visual field and corresponding macular and nerve fiber layer volume as early as one month, and lasting for at least 18 months.8 To date, NT-501 has been generally safe with approximately 1,000 person-years of cumulative exposure. ECT has led to the development of NT-503 in which cells have been engineered to continuously produce a soluble VEGF receptor (sVEGFR) fusion protein for the treatment of wet AMD and other neovascular diseases of the retina. Design Evolution of the NT-503 Device: Multiple device configurations have been employed to support dose-escalation of NT-503 across a wide range of release rates. By varying device size, cell counts, and membrane permeability, and by increasing the number of chambers in each device, the release rates have been augmented approximately 30-fold. 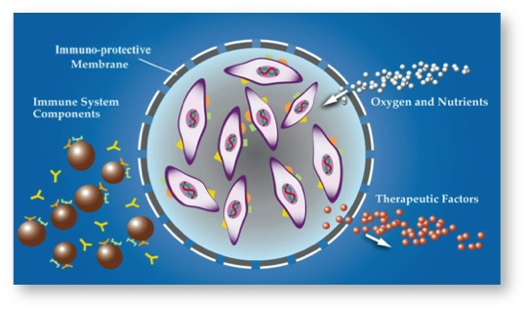 The latest and highest producing configuration for the NT-503 program, ECT 3, is a five-chamber device, to be implanted as a single device, which also allows for individual chambers to be loaded with more than one protein-expressing cell line for combination therapy. A VEGFR/platelet-derived growth factor combination product is in development. Pharmacology : In vitro, NT-503 produced sVEGFR protein binds with picomolar affinity to human VEGF-A, similar to the reported values for aflibercept (Regeneron Pharmaceuticals; Tarrytown, NY) and with approximately 700 times greater efficiency than ranibizumab. Pharmacodynamics : The ability of sVEGFR produced by the NT-503 cell line to neutralize VEGF and prevent neovascular development has been evaluated in a rodent matrigel model of choroidal neovascular membrane (CNV). A 95% reduction in CNV lesion size and volume was demonstrated after a single intravitreal injection. Pharmacokinetics: In-vivo studies in rabbits with NT-503 demonstrated continuous and steady delivery of NT-503 at the 0.4-0.5 μg/day and 2.0-2.5 μg/day doses over 18 months. The ECT 3, five-chamber device, is anticipated to increase vitreous dose levels approximately four- to five-fold over that achieved with the ECT 2 configuration. Toxicology : A nine-month GLP (good laboratory practice) toxicology study in rabbits showed a single ECT 3 implant is in the “No Observable Adverse Effect Level” (NOAEL) category, being well-tolerated with no significant clinical, electroretinographic, laboratory or histopathologic abnormalities. Two doses are being evaluated in an ongoing, dose-escalating study using the ECT 2 configuration: 2.0-2.5 μg/d (one device) and 4.0-5.0 μg/d (two devices). A dose response has been observed for both the improvement of visual acuity and the reduction in central retinal thickening for 20 months of follow-up, to date. The ECT 3 configuration, which achieves an approximate two-fold increase (8.0-10.0 μg/d) in release rate over that tested previously, is currently being evaluated in a phase 1 study in Israel. A two-year randomized, double-masked, controlled phase 2 study of a single NT-503 device versus aflibercept dosed every eight weeks in patients who have received at least three prior anti-VEGF injections and still respond well to therapy is expected to begin in April in the United States. ECT is a flexible drug delivery platform capable of producing a wide array of therapeutic proteins at constant levels for multiple years. Recent data suggesting improvements in visual field and corresponding improvements in macular and nerve fiber layer volume with NT-501 (CNTF) in glaucoma is intriguing. NT-503 (VEGFR) is well tolerated and achieves clinically meaningful improvements in visual acuity and reductions in macular thickening for at least 20 months following surgical implantation in patients with wet AMD. NT-503 in the ECT 3 implant is expected to have efficacy at least comparable to existing anti-VEGF therapies, and will be compared with aflibercept in an upcoming randomized, double-masked, controlled phase 2 trial. Reference(s): 1. Rosenfeld PF, Brown DM, Heier JS, et al; MARINA Study Group. Ranibizumab for neovascular age-related macular degeneration. N Engl J Med. 2006;355(14):1419-1431. 2. Brown DM, Kaiser PK, Michels M, et al; ANCHOR Study Group. Ranibizumab versus verteporfin for neovascular age-related macular degeneration. N Engl J Med. 2006;355(14):1432-1444. 3. Cohen SY, DuBois L, Tadayoni R, et al. Results of one-year’s treatment with ranibizumab for exudative age-related macular degeneration in a clinical setting. Am J Ophthalmol. 2009;148(3):409-413. 4. Dadgostar H, Ventura AA, Chung JY, Sharma S, Kaiser PK. Evaluation of injection frequency and visual acuity outcomes for ranibizumab monotherapy in exudative age-related macular degeneration. Ophthalmology. 2009;116(9):1740-1747. 5. 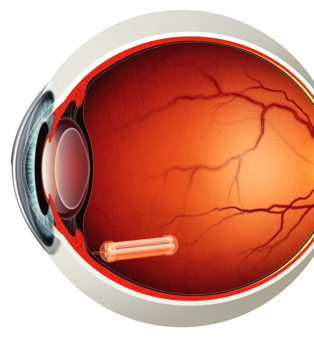 Kauper K, McGovern C, Sherman S, Heatherton P, Rapoza R, Stabila P, Dean B, Lee A, Borges S, Bouchard B, Tao W. Two-year intraocular delivery of ciliary neurotrophic factor by encapsulated cell technology implants in patients with chronic retinal degenerative diseases. Invest Ophthalmol Vis Sci. 2012;53(12):7484-91. 6. Zhang K, Hopkins JJ, Heier, et al. Ciliary neurotrophic factor delivered by encapsulated cell intraocular implants for treatment of geographic atrophy in age-related macular degeneration. Proc Natl Acad Sci U S A. 2011;108(15):6241-6245. 7. Birch DG, Weleber RG, Duncan JL, Jaffe GJ, Tao W; Ciliary Neurotrophic Factor Retinitis Pigmentosa Study Groups. Randomized trial of ciliary neurotrophic factor delivered by encapsulated cell intraocular implants for retinitis pigmentosa. Am J Ophthalmol. 2013;156(2):283-292. 8. 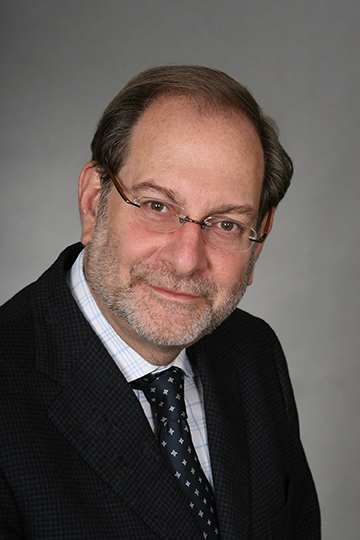 Goldberg, J. Neuroenhancement, Neuroprotection and Regeneration in Glaucoma. Presented as part of the Ocular Drug and Gene Delivery to the Posterior Segment seminar. American Academy of Ophthalmology 2014 Conference, Chicago.